Expecting a baby? If the answer is YES, you might have already spent countless hours in search of all the baby essentials you may need. A bassinet is probably near the top of your baby list. Even though most bassinets are convenient and affordable, finding the right one for your newborn may be challenging. It should be stable, safe, well-built and reasonably priced. But the staggering amount of bassinet options available on the market today isn’t making your search easy. Luckily, there are some excellent budget bassinets that can keep your baby comfortable and safe. So don’t hesitate to check out our top picks for the best bassinet under $50. The Sorbus baby crib cradle has a beautiful vintage look and provides your baby with the comfort they need while gently rocking them to sleep in a hammock style bassinet. The Sorbus baby crib cradle is a stylish addition to your nursery since it features durable and sturdy macramé knotting with reinforced hanging ropes. This bassinet weighs only 5.16 pounds which makes it very portable. The Sorbus bassinet’s measurements are 35.8 x 23.2 x 1.4 inches and you may use it as a travel cot or move it from one room to the next without too much hassle. What’s more, the bassinet is suitable for both indoor and outdoor use so you can easily take your baby to the backyard or terrace. The bassinet has a macramé pattern basket and soft protective cushion. It is important to note that the Sorbus bassinet is made of 100% cotton so there is very little chance of skin irritation or other allergic reactions for your baby. The macramé pattern is carefully knotted and wide to allow enough airflow for your newborn. The Sorbus bassinet is suitable for newborns up to one year old and the weight capacity is 22 pounds. Also, it is worth mentioning that the height of the cradle without the rope is 14 inches which allows you to gently swing the baby without any risk of an accident. Many have raved about this bassinet option and chosen it as a great gift for a friend or family member who is expecting. The Bambini & ME 3-in-1 bassinet is designed for busy parents who need to take care of their infants on the go. If you are looking for a modern, versatile and extremely portable bassinet with a lot of added functionality, this might be the right one for you. The Bambini & ME is more than just a bassinet, it is also a portable changing station equipped with insulated bottle cooler and zipped pockets. It also comes with a chevron-fitted sheet. Adding to the travel-ready design is this 3-in-1 bassinet is extreme compactness and light weight foldable material with velcro snaps. It measures 13.5 x 3 x 13.5 inches and weighs only 3.81 pounds. The Bambini & ME managed to fit a changing station, diaper bag and bassinet in a bag of such a small footprint. 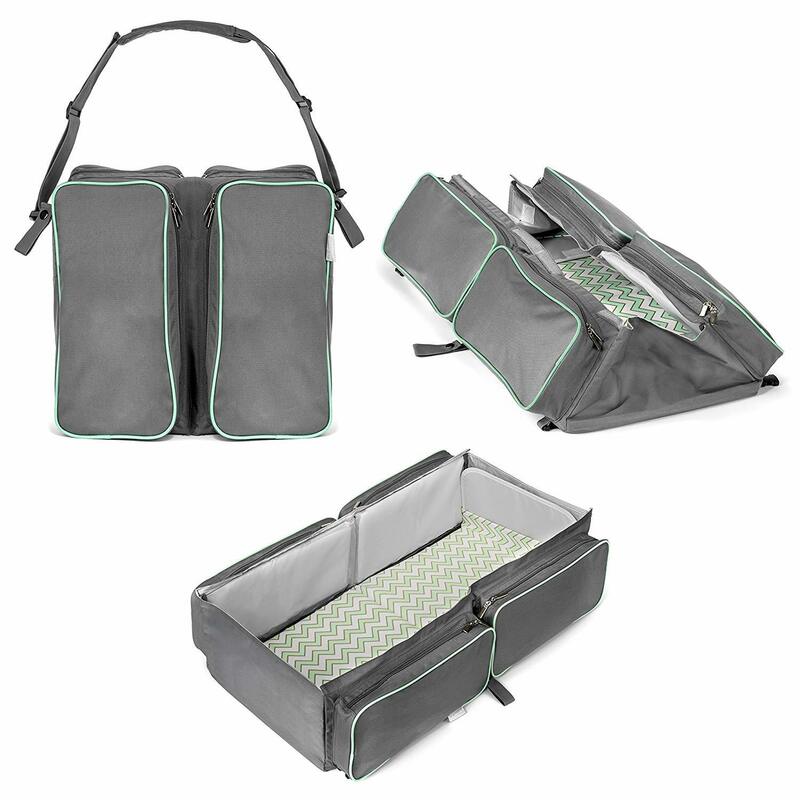 This bassinet also features five premium storage pockets besides the aforementioned insulated baby bottle cooler. It was strategically designed for you to be able to easily carry it around with an adjustable shoulder strap. The strap sits well on your shoulder and the ergonomic design should allow you to carry the 3-in-1 bassinet for an extended period of time without feeling any fatigue. The inside of the bassinet has comfortable protective padding and a soft sheet cover is placed over a thick soft mattress. Built with plenty of room for your baby to be comfortable while you are changing his or her diaper. The Bambini & ME 3-in-1 has waterproof mattress and very easy to clean which is important to most new parents. Overall, this bassinet is a great solution for parents who are on-the-go but prefer to have their baby by their side. The Sweet Beginnings bassinet by Delta children’s products features an ideal combination of vintage design and contemporary functionality. The design of this bassinet may remind you of some vintage cribs with a removable or adjustable canopy with a modern twist. 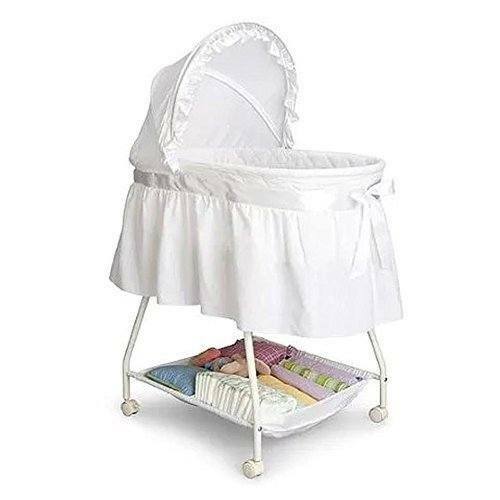 The Delta bassinet comes with soft white fabric and elegant trim which extends well over the frame. The lightweight metal frame is durable and portable. The Delta bassinet sits on locking casters which allows you to easily move it from one room to another. There are two convenient storage sections underneath the bassinet which are big enough to store most of the things you need for your baby. Also, the Delta bassinet comes with a 1-inch mattress pad and washable mattress sheet. It feels soft and high-quality for your baby to comfortably sleep in the bassinet. When assembled, the bassinet measures 35 x 21 x 45.5 inches and can hold up to 15 pounds of weight. Even though this bassinet was not created for travel, you can take it to your backyard or terrace for your baby to enjoy some fresh air if you wish. The Sweet Beginnings bassinet is probably one of the, if not the best bassinet, under $50. We understand that the right bassinet will give you piece of mind and your baby sweet dreams while also keeping you within budget. We recommend Delta children’s products’ Sweet Beginnings bassinet as the best bassinet under $50. The overall build quality, which translates to baby comfort and safety, combined with ample storage capacity to make this bassinet stand out on the market today. It is also easily movable and ideally suited for home use. The baby bassinet you choose should be about a combination of your standards and the best quality. Everyone also loves a budget friendly option too! Happy Baby Shopping!